There has been a lot of press lately about Laser Eye Jewelry (also known as La SER jewelry), created by the Shekhar Institute in Mumbai. They’re offering a rather strange way of giving the eyes some extra bling- diamond studded contact lenses for that extra sparkle. Though this is definitely one way to change the look of your eyes, other similar fads have emerged in recent years, and I thought this would be a good space to showcase them for you. There’ been a lot of creativity in the sphere of eye decoration, some scary, some involving surgery, and some that can actually correct your eyesight whilst you sleep. Here’s my pick of six ultra strange eye inventions that will really let you make the most of those peepers. Soomi Park is a talented designer with a playful side, and I love her LED Eyelashes which she created as part of a university project. 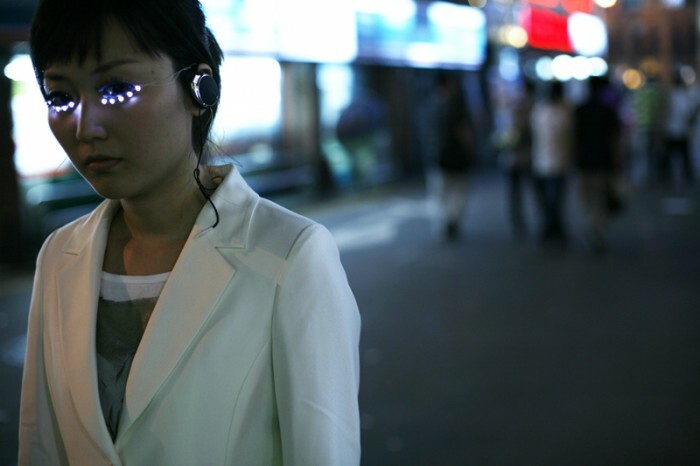 She looked at the Asian desire for bigger ‘Western eyes’, and came up with LED Eyelashes, which make the eyes unavoidably focal, drawing attention with every flutter. The LED lashes feature a tilt sensor with mercury to turn them on and off. The sensor perceives the movements of the pupil in the eyes and eyelid, and will flicker the lashes according to the movements of your body. Application is called ‘as simple as wearing false lashes’ (lots of faffing around with glue then) but the finished product is very striking. It might not be for everyday wear, but I could see club kids loving this. For those with more money than sense- or looking to really highlight their eyes- you might want to think about wearing 18 carat diamonds and gold plate..on your eyeballs. 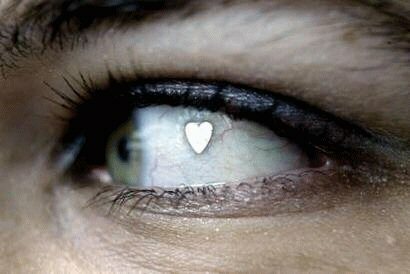 La SER Eye jewellery is essentially designer contact lenses with added bling, but the institute promises it’s not harmful to the eyes as they set the bling in such a way that it doesn’t touch the cornea. A set of lenses cost a mere $15,000 and are custom made with current design options being diamonds on white gold, diamonds on yellow gold, or just gold or yellow gold. Glasses wearers are catered for (yay, me!) as the contacts can be made to any prescription and was apparently inspired by the trend for tooth jewellery (see here for my report on teeth tattoos!). The company say that La SER eye Jewelery actually helps those less fortunate, as for every pair sold, one low income person will be treated for Stevens Johnson Syndrome for free. So, $15,000 a pair and an extra helping of goodwill? Why not! I suffer from poor vision and regularly wear contact lenses (possibly over wearing, according to my optician). Though they’re great for day to day tasks, they can be annoying in certain environments- swimming, for example of awful and I tear up anytime I’m in the sea. 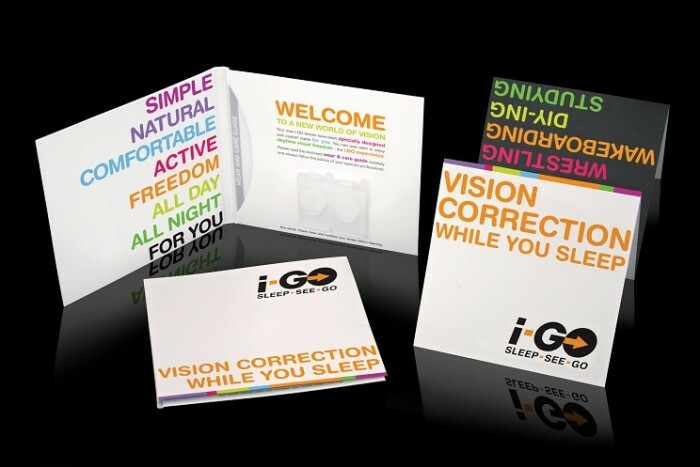 I Go Lenses are specially created convex contact lenses that you wear overnight. They’re custom made to each individual and work by gently flattening the cornea as you sleep. This gently pressure changes the angle at which light enters the eye, and as the ye is so elastic it holds that shape for around 36 hours, meaning you’ll wake, remove the lenses and have perfect contact lens free vision. Think of it as how everything gets sharper when you squint- you’re essentially involving yourself in prolonged nightly squinting to leave you contact lens free in the day. If your prescription is between -5 and +1.5 you can book in for an assessment, and it sounds amazing. The technical name for this process is Accelerated Orthokeratology, and the digram from this website– see below- explains this a little more clearly. The Anime craze is huge in Japan and the trend is making its way to the UK shore. Once you’ve got your harajuku ribbons on and booked in for the next Cosplay convention ( October in London if you’re interested) you might want to think about trying out Circle lenses. Lady GaGa wore them in a recent video, and you too can have the crazed wide eyed doll look if you wish. This is a REAL product that you can have carried out- and it’s really strange. Body modification has just got extra sparkly, but I’m wary about surgeons getting near my eyes, no matter how pretty the results. The Netherlands Institute for Innovative Ocular Surgery has created something they call ‘JewelEye’ which is where they insert an extraocular implant onto the eye through a complicated process. They say this is completely safe and will lead to the eyes becoming a deeper expression of who you are- options to choose from are heart, diamond, four leafed clover, music note and other shapes on request. The price varies from website to website, but 500 Euros seems to be the most agreed upon price. Here’s how they do this- I realize this may not make that much sense but I wanted to elaborate how this is a REAL operation in a REAL hospital, and just let that sink in for a bit. (I have left their spelling up FYI, in case you think I’ve suddenly turned illiterate). The eye is anesthetized with routine eye-drop anesthesia medication. The eye is decontaminated and draped with routine techniques used in ocular surgery. An INTRAconjunctival bleb is created by injection of BSS in the most superficial conjunctival layer. The bleb may be positioned adjacent to the temporal limbus. With conjunctival scissors, the bleb is opened and a superficial intraconjunctival tunnel is made. The tunnel is checked to determine if it is wide enough to accommodate the CEI implantation device. The CEI is then loaded into the CEI implantation device, and the device is inserted into the tunnel up to the desired final position of the CEI. Using a routine fine-forceps, the CEI is removed from the CEI implantation device and the CEI implantation device is withdrawn from the conjunctival tunnel. With a spounge, all excess BSS is removed from the implantation area. At the end of the procedure, antibiotic drops are applied onto the eye. Postoperative management includes antibiotic eyedrops for 1-2 week(s). Still thinking of having it done? Here’s the how-to video they produced ( don’t try this at home). Find out more about this procedure here. 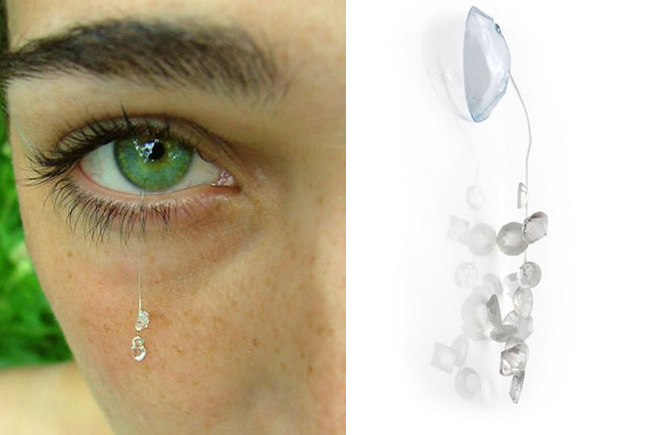 I think that Eric Larenbeek’s eye jewellery is beautiful but fairly deadly. I have enough trouble not catching my earrings on my hair- what if that trailing gem was attached to my eye? Mmm, don’t like to think about that. Nonetheless, Eric’s designs are strangely alluring, making the eyes seem like repositories for jewels and making even the fiercest person suddenly frail and ethereal. If Tolkien had heard about this, all his elves would have been sporting these. They were created in 2006 and originally the plan was to sell them for around $350 a pair. You place the decorated contact lens in your eye, and a small jewel design dangles delicately from it, attached by a copper medical wire. I’d not sure if Eric ever got his patent approved, as though these now feature on his website, there’s no option of buying them.. which might be for the best.